Book launch – the first orders are in! 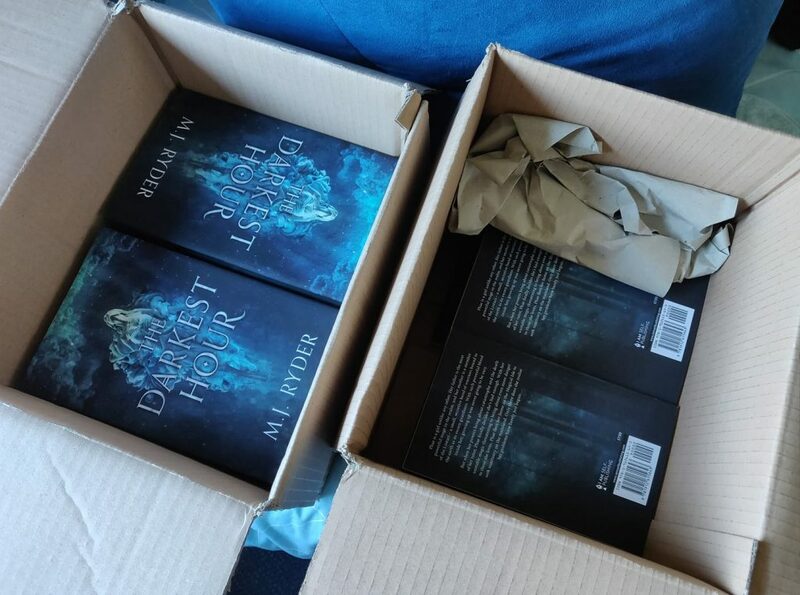 I’ve just recently received the first bulk order of The Darkest Hour ready for launch, and have to say I’m really pleased with the results. The hardbacks look particularly good, and were definitely worth the extra investment. I’m currently working my way through my various contacts, posting out hardback and paperback copies to individuals who have asked for signed copies and/or extra books to give away as gifts. I’ve already posted off several large parcels, and there are sure to be more as more orders come in. The first bulk orders arrive! Though I’ve already sort of started on a ‘soft launch’ of my book, there’s still lots to do. I’m really keen to get a micro-site up and running as soon as possible, once I’ve received the final version of my book marketing video from my publisher. I will then also put the video up on YouTube, my Facebook page, Amazon author page and of course Goodreads. Aside from digital marketing, I’ve also invested in a slot in Ingram Advance, a trade publication that is distributed to book sellers. I’m also working on advertising posters, regular book posters and bookmarks. However, at present I can’t do any of this until my microsite is done, as all the print materials feature a URL that isn’t currently live. I already own the domain(s) and hosting – I’m just waiting on the video… Once this is done all the other pieces can start slotting together! If you’d like a copy of The Darkest Hour you can contact me via my Facebook page or this website to arrange special orders and postage. Alternatively, you can order the paperback version direct from Amazon. The e-book version will be released on Saturday 20th October. If you are interested in reviewing The Darkest Hour for a recognised publication, please contact me and I will be happy to discuss advance copies, whether they be in print or electronic format. More details as and when I have them! As you start to turn the pages of this novel, time vanishes! You will soon become whisked away on a hard wrought journey alongside the young Phae, to the point that you loose track of all else around you. For me this meant reading right through dinner, strictly and straight into the evening! This is a must read, as you share in her tragic tale. Having read The Powers That Be, I was thrilled to reacquaint myself with Arron and Callum to mention but two of the characters. You can read this as a stand alone or as a continuation. I would most certainly recommend it, and can’t wait to see what future reads will be released! What an epic read from the initial turn of the pages through to the end. The story follows several characters who lives intertwined as the story unfolds. The twists and turns of good verses evil keep you on the edge of your seat. As the reader you certainly go through a mixed bag of emotions whilst emerged in such an incredible read and for me unexpected tears towards the end of the journey reflecting a brilliant read.